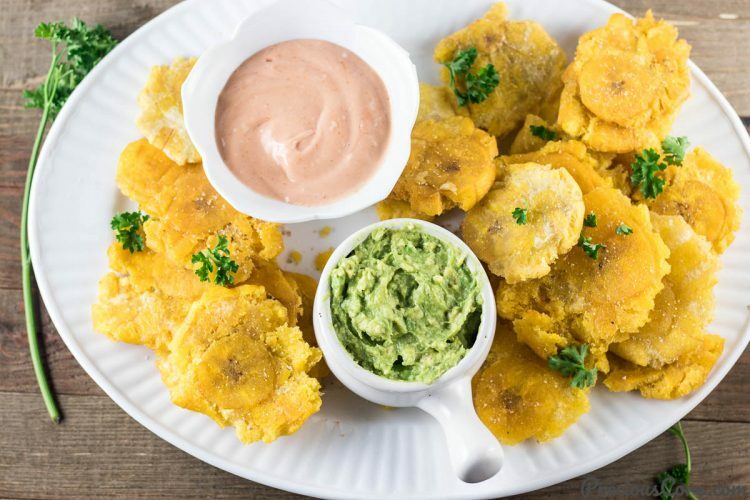 This Tostones Recipe is the recipe you need for entertaining. It is the recipe to make when you want to impress. 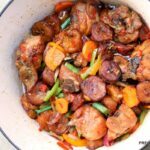 It is the recipe to make when you want to experience the wonders of plantains. Tostones are simply twice-fried plantains. 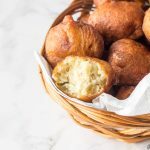 The plantains are crispy, so tasty and great with your favorite dipping sauce (check below for dipping sauce ideas!) as an appetizer or great as a side dish. 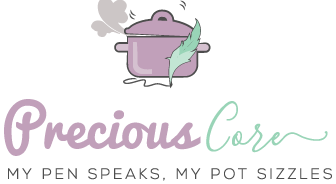 Either way, everyone will be asking for your tostones recipe! 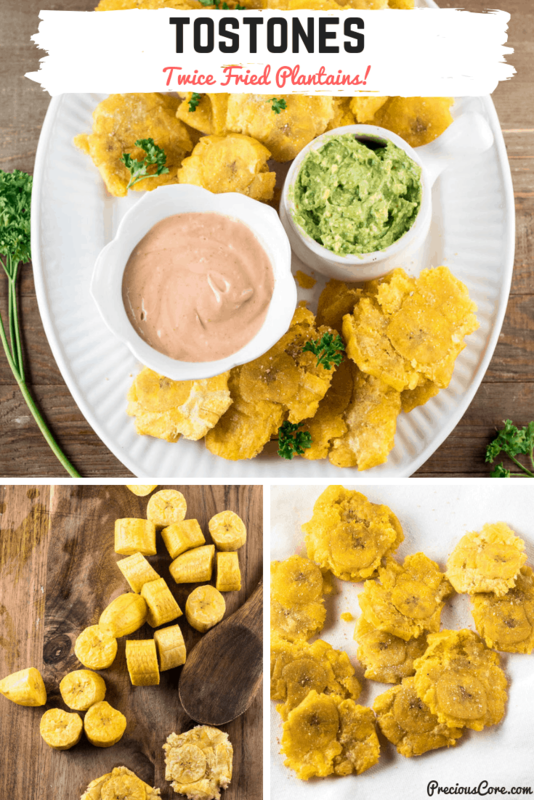 One of my missions on this blog is to bring you insanely delicious recipes every time so it will be a sin if I do not share this tostones recipe with you guys. These are not your average fried plantains. The plantains here are fried twice. The first time, you merely boil the plantains in the oil. Then you take them out and smash them then fry the second time for crunchiness. The plantains are super duper crunchy! 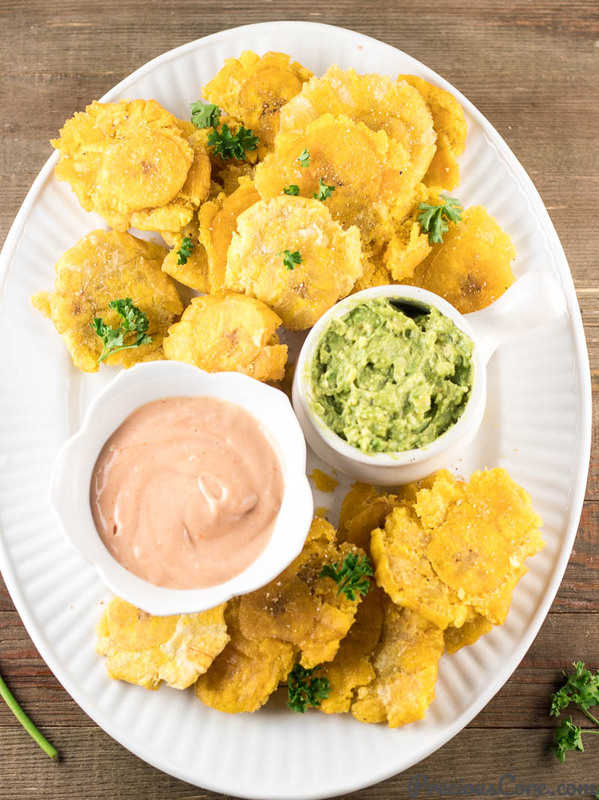 You will want to give up your favorite chips for these tostones. Tostones are enjoyed in different parts of the world where plantains are eaten. 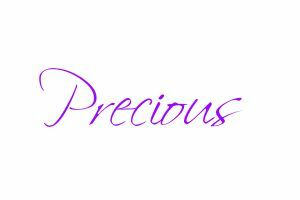 They are a staple in Latin American countries and the Carribean. In my country, Cameroon, they are referred to as Tapé Tapé. Tostones can be enjoyed with almost anything on the side. I have had them as a side dish in a Carribean restaurant. So they totally work as a side dish! I also add some freshly cracked white pepper to taste because I love the flavor of white pepper! But you could totally leave that out. The best plantains to use for tostones are green plantains or plantains that barely started getting yellow. The plantains which just started getting yellow will yield slightly sweet tostones which are so tasty! 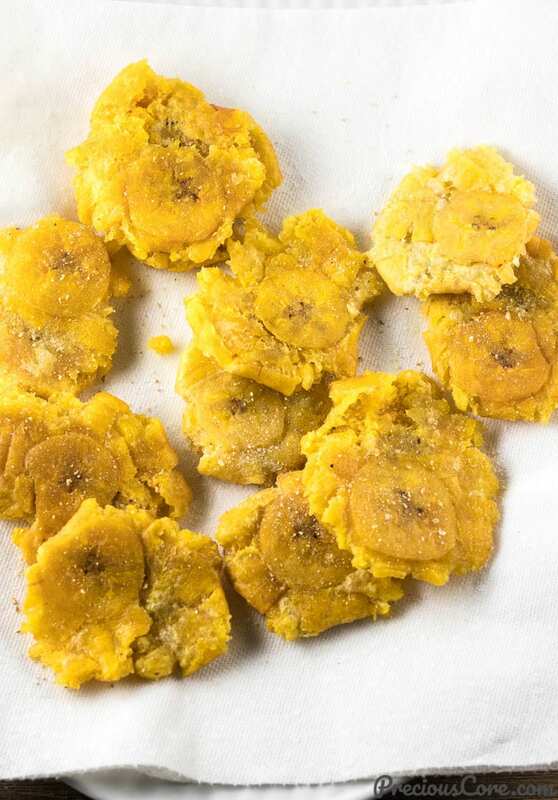 However, stay away from using yellow/ripe plantains for your tostones because if you use them, your twice-fried plantains won’t turn out crunchy. 1. 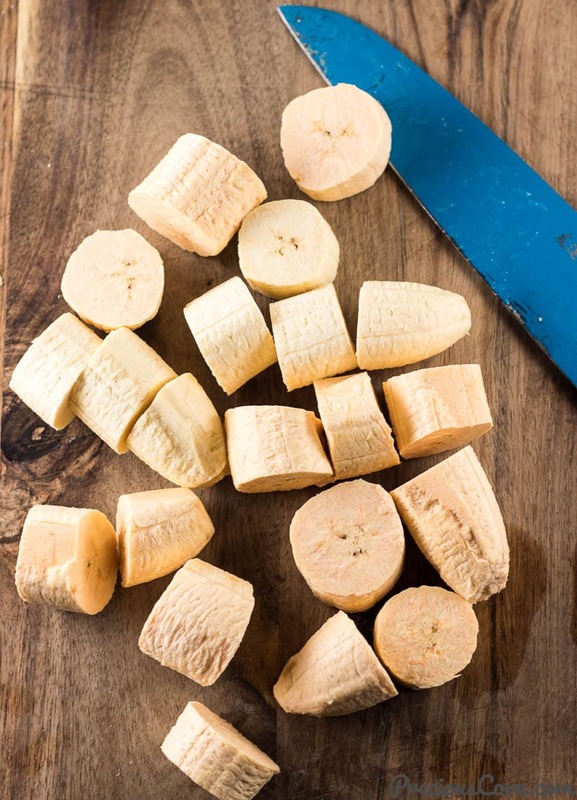 Peel some plantains then cut into 1-2 inch slices. 2. Fry plantains in oil for about 4 minutes. Remove from oil and place on paper towel to absorb excess oil then immediately place on a chopping board. 3. Flatten plantains using the back of a wooden spoon or a cup. 4. Fry plantains the second time for about 5 minutes until crunchy. Season with salt immediately you remove plantains from oil. You can bake tostones instead of frying them. If you choose to bake them instead, first boil them instead of frying then place them on a greased baking tray or a tray lined with parchment paper. Drizzle olive oil on top and bake them until crispy around the edges. Sprinkle salt on them as soon as they are out of the oven. Simple Guacamole: Mash one large avocado or two small avocados. Season with salt and black pepper to taste. Squeeze in the juice of half a lime. Mix, taste to adjust seasoning and serve! Mayo-Ketch Sauce: Mix together a quarter cup of mayo and a quarter cup of ketchup until combined. 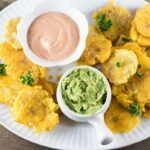 Serve with your tostones! Plantain Lasagna: Layers of plantains meat and cheese baked into an incredible dinner. So good, it is hard to describe. Click here for the recipe. Sweet Fried Plantains: Ripe plantains deep-fried to golden brown perfection. Pair with a vegetable omelet or enjoy as it is. Click here for the recipe. Plantain Frittata: Plantains cooked together with veggies in a frittata. 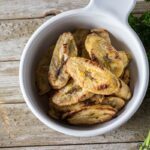 The ultimate breakfast or brunch plantain meal! Click here for the recipe. these twice-fried plantains are crispy with that unbeatable plantain taste that is to die. I love to sprinkle them with fresh ground sea salt and freshly ground white pepper. This takes the takes to a whole 'nother level! Peel plantains. 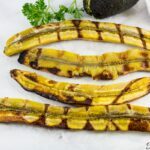 Make a slit from the top to the bottom of a plantain with a knife. Gently pull the plantain skin away from the flesh then remove the rest of the skin with your hands. Peel any tough portions of the skin with a knife. Place oil in a frying pan up to 4 inches and heat up on high for about 8 minutes. Place plantain slices in the oil and let them cook for about 4 minutes. Flip the plantains halfway through cooking. Remove plantains from oil and place immediately on paper towels to absorb excess oil. 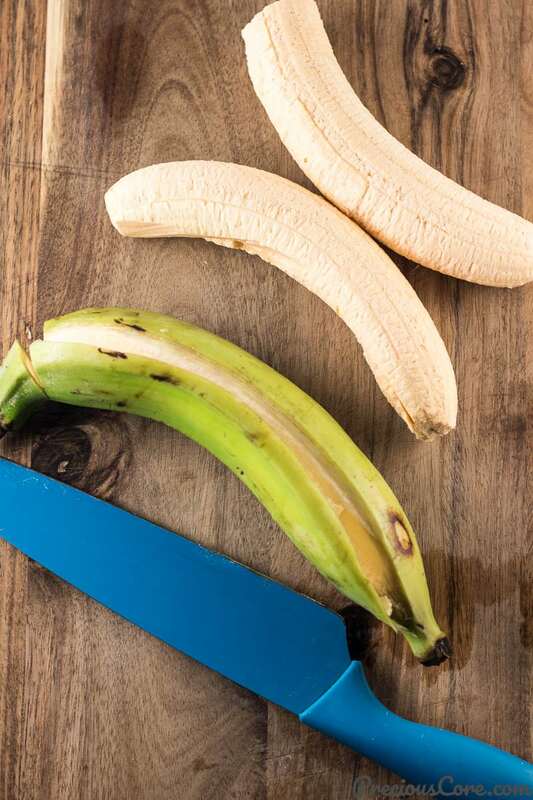 Remove the plantains from the paper towels then immediately use the back of a large wooden to press/flatten the plantain slices - you could also use a glass to flatten them. Once you are done flattening half of the plantains, return to oil and let them fry while you flatten the remaining plantains. Let the plantains cook for the second time about 5 minutes until crunchy. Take them off the oil place on paper towels then immediately sprinkle on some salt and freshly cracked white pepper to taste. Repeat the process with the remaining plantains. 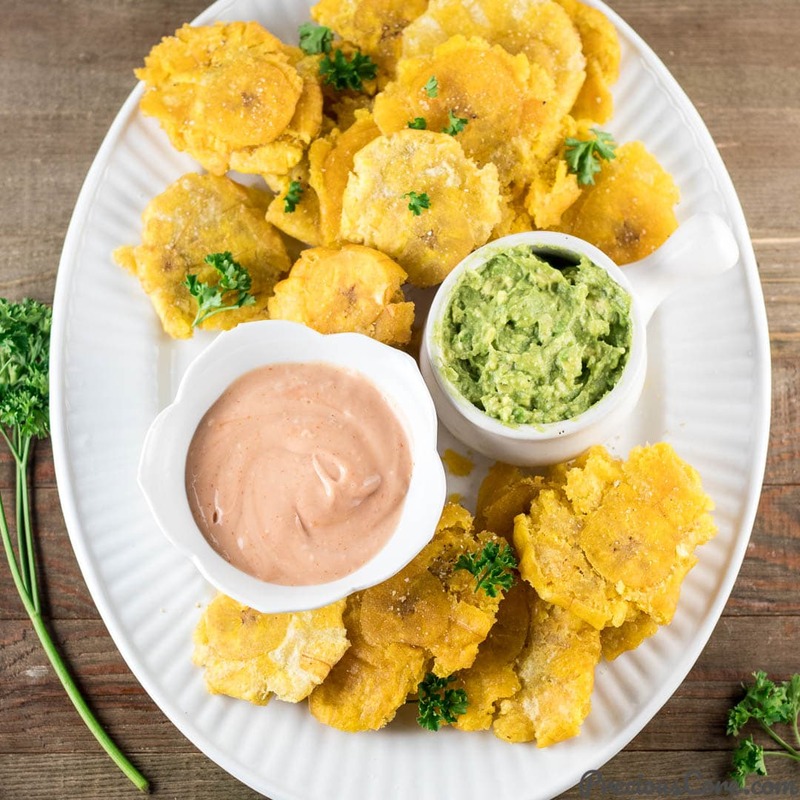 Serve the tostones with your favorite dipping sauce. I love enjoying them with guacamole or a mayonnaise-ketchup dipping sauce. For the mayo-ketch dipping sauce, simply combine a quarter cup of mayo and a quarter cup of ketchup then mix well. Insanely delicious! 1. 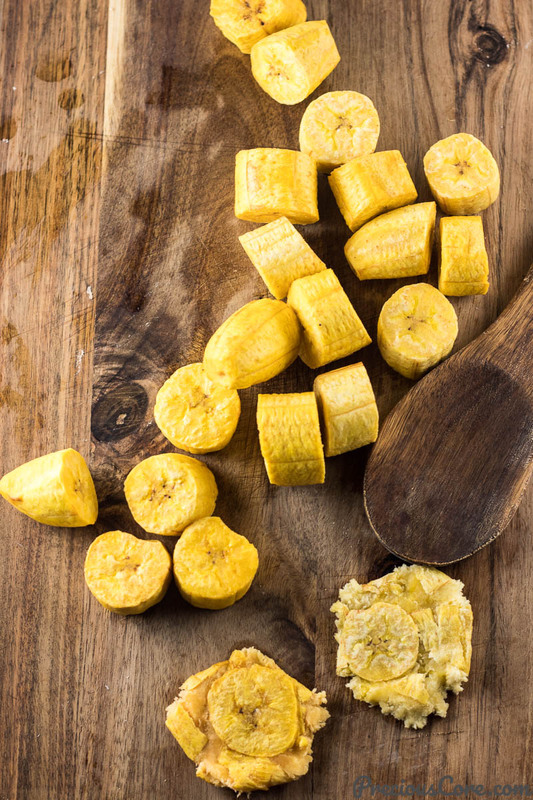 The best plantains to use for tostones are green plantains or plantains that barely started getting yellow. The plantains which just started getting yellow will yield slightly sweet tostones which are so tasty! 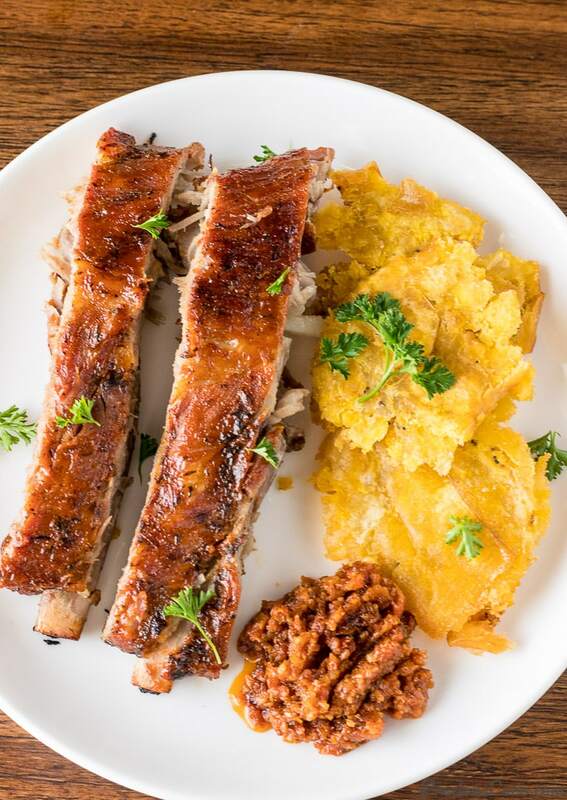 However, stay away from using yellow/ripe plantains for your tostones because if you use them, your twice-fried plantains won't turn out crunchy. 2. I always keep whole white pepper in a pepper grinder. That way, I can always add freshly cracked white pepper to any meal. If you don't have a pepper grinder or whole white pepper, feel free to use already ground white pepper or omit the white pepper. Your tostones will still taste great without pepper! 3. I use sea salt because it is a great finishing salt. But you could sprinkle your tostones with regular salt to taste. Just make sure you do not skip the salt because if you do, they will turn out bland. How long would you boil them? How long in the oven and at what temperature? Hi Brian, put plantains in a pot and pour in water to the same level as the plantains. Bring to a boil and let them cook on medium heat for about 15 minutes until tender when poked with a fork. Smash them, drizzle on some oil and sprinkle on some salt then bake at 450 degrees Fahrenheit for about 10 minutes or until crispy around the edges. Hope this helps. You are so sweet, Claire. Thank you and glad you love the recipe. Plantain tape with roasted fish. Ohh reminds me of street food. Finger licking good!!! Plan to make this soon. By the way i used your tip to add the spice “bebe” to roasted fish and the sauce a few weeks ago and it was great. So glad the tip was useful, sis. Thank you for the feedback! Hope you enjoy the plantain tape too.